I expect to see an increase in earthquakes larger than 2.5 magnitude affecting Los Angeles during the Spring of 2019 in comparison to Spring of 2018 when 8 earthquakes occurred (see prior post). I am basing this on ingress charts of earthquakes over 4.9 magnitude that have occurred more than 2 years ago and 2.5 magnitude that I have tracked since 2017. Of the earthquakes over 4.9 magnitude and older than Summer 2017, the 5.1 magnitude La Habra earthquake occurred on March 29, 2014. This year’s Spring Ingress chart is similar to the 1941 Fall Ingress chart with Mars in the 10th house and Uranus conjunct the Midheaven. 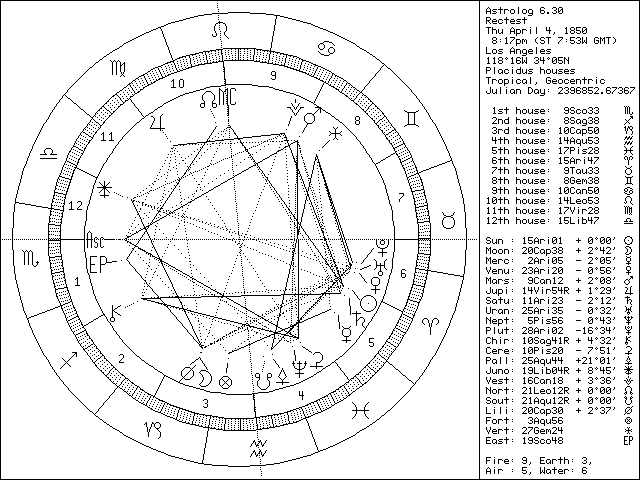 The 1941 chart shows Saturn and Uranus in the 10th house. During the Fall of 1941, Los Angeles experienced 2 earthquakes measuring 4.8 magnitude.